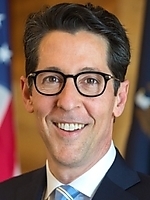 Info After two decades of community leadership, Joe Torsella has earned a reputation as a champion of innovative solutions, new ideas, and leading edge thinking. Whether he’s working as one of the principal architects of Philadelphia’s miraculous fiscal turnaround in the 1990s, paving the way for the creation of the world-renowned Constitution Center, or serving as Chairman of the State Board of Education, Joe’s work has always created opportunity and promoted progress. At every stage in his career in public service, Joe, a lifelong Democrat, has emerged as a civic leader whose vision has produced some remarkable results. Joe was raised with a sense of duty and commitment to one’s community. Those principles have guided him through every job he has ever had and every project he has ever led. In 1992, when Joe was named Deputy Mayor for Policy and Planning in the Administration of newly-elected Mayor Edward G. Rendell, he took charge of a number of reforms that helped save the city from bankruptcy. The changes sparked a transformation that the New York Times described as the “most stunning turnaround in recent urban history.” Under his leadership, the Policy and Planning office became the nerve center of Philadelphia's reform agenda. The office’s impact — and Joe’s efforts there — are still felt today throughout the city, region, and Commonwealth. In 1997, Joe again answered the call of public service. At Rendell’s urging, Joe took the reins of an entirely new enterprise — the National Constitution Center. The important project’s progress had been stalled and so Joe got to work right away, bringing the Center from the drawing board to reality. In addition to his career in government and at the groundbreaking National Constitution Center, Joe has served in a variety of other civic leadership posts. In 2005, he co-chaired the Greater Philadelphia bid for the 2016 Olympic Games. Philadelphia’s bid won great respect from Olympic officials and raised the region’s profile as a world-class venue for international sporting events. Joe additionally served as co-chairman of the Philadelphia Olympic and International Sports Project, an organization that has already succeeded in attracting Olympic team trial events to the state. In August 2008, Governor Rendell again tapped Joe — this time to serve on the State Board of Education. Just five months after being appointed, Joe was named as the Board’s Chairman. The board is the regulatory authority for all educational entities in Pennsylvania including 501 public school districts and 14 state universities. Joe’s accomplishments and work ethic are rooted in the lessons he learned from his family. Joe’s grandfather was an Italian immigrant who arrived in America with nothing but a desire to work hard and provide for his family. Joe’s parents instilled in him a love of learning and the lesson that only hard work could guarantee success. In Joe’s childhood home, education and hard work weren’t just appreciated, they were expected. Joe was born and raised in Berwick, PA, a riverside town in Northeastern Pennsylvania best known as the home of Wise potato chips and the legendary Berwick High School Bulldogs, a national high school football powerhouse. Joe’s father was a small-town lawyer who represented the town of Berwick and provided legal services to a legion of civic organizations and projects. Joe’s mother worked as a nurse and went back to school at night while holding a full time job and raising a family. She eventually earned both a Master’s degree and Ph.D. in nursing. As a young adult, Joe was industrious, earning his first paycheck at the age of 13 working after school and on weekends as a stock boy, mowing lawns, bagging burgers at McDonalds, and clerking at the Hotel Berwick. At one point Joe even ran his own small company called, Joseph M. Torsella, Magic for All Occasions. After graduating from Wyoming Seminary in Kingston, PA, Joe attended University of Pennsylvania assisted by financial aid and scholarships. Joe majored in economics and history. In his senior year, he was named a Rhodes Scholar, and continued his studies at Oxford University in England. Joe and his wife, Carolyn Short Torsella, live with their four children in Flourtown, a Montgomery County suburb of Philadelphia. 04/28/2020 PA Treasurer - D Primary ?? ?